I am a firm believer in good skincare. Your skin needs to be looked after well to ensure that your makeup applies smoothly, you can use less makeup and your future self and skin will thank you! I like to keep my routine fairly basic, if you are trying to figure out a routine, start with the basics. Cleanse, tone, moisturizer. Then you can add in extra products depending on your skin and lifestyle. In the morning I use the Clarins water purify one-step cleanser (see review here) to cleanse and tone. I love how quick and easy this is to use, perfect for mornings when you are half asleep! I then follow up with moisturizer. In the evening, I remove my makeup using Garnier fresh essentials cleansing milk. 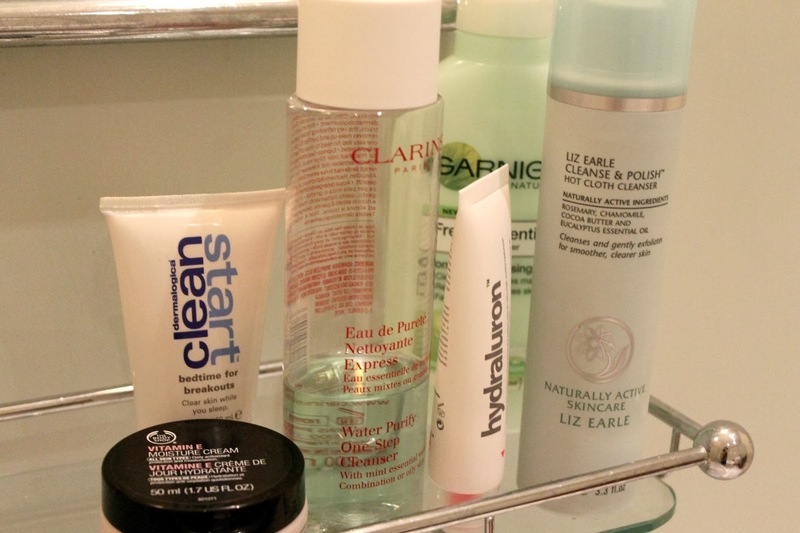 This takes the bulk of my makeup off, any left over makeup will be removed with my cleanser. 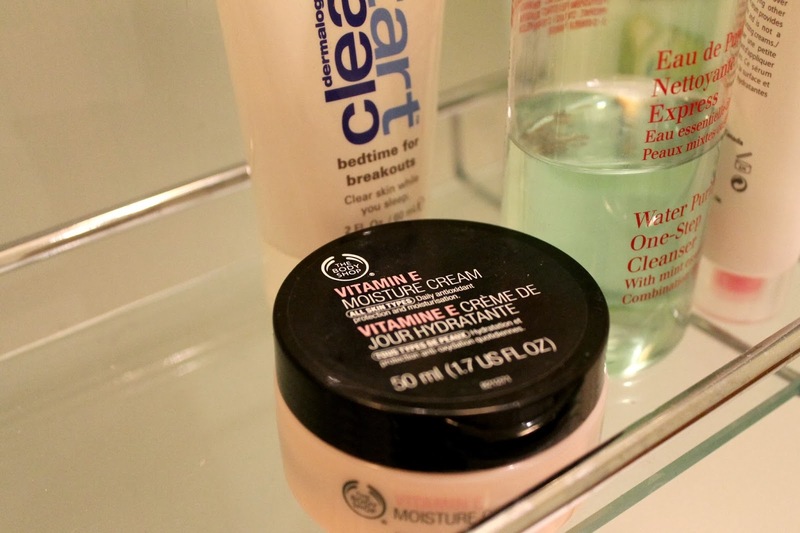 By removing my makeup first, it leaves the cleanser to work into the skin more. 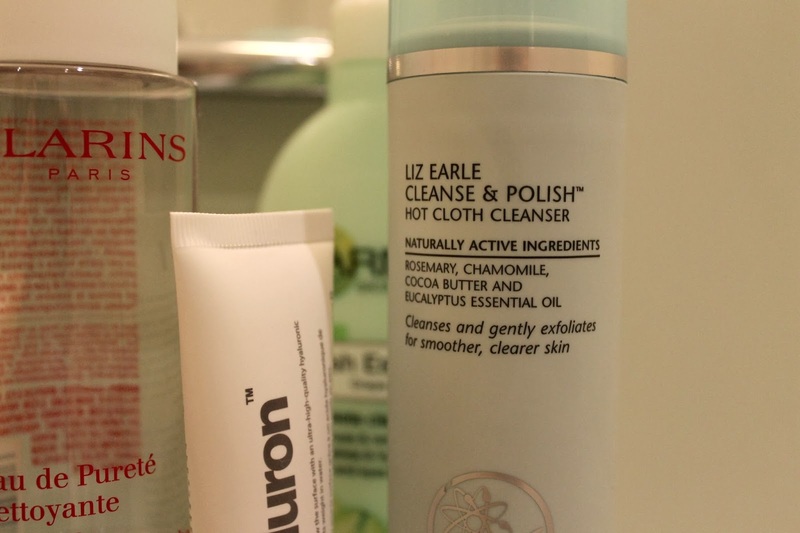 As my cleanser, I use the Liz Earle Cleanse and Polish hot cloth cleanser. It is a creamy cleanser that can be applied directly to a dry face, then using the muslin cloth rinsed in hot water, you remove it. This method effectively removes makeup and gently exfoliates the face. It has a soothing scent, is packed with natural ingredients and suits all skin types. I use this every evening but it can be used twice daily. I then use hydralouron as my serum, it helps my skin to retain moisture. I'm sure you will no all about this by now but if not see my review HERE. To keep any blemishes at bay, I use Clean Start, bedtime for breakouts, this prevents any blemishes from appearing and reduces the appearance of any pesky spots. My favourite moisturizer is The Body Shop's moisture cream. This stuff is seriously great, it absorbs very quickly and hydrates efficiently with a subtle scent. I use this in the morning and evening. NOTE: As I have recently bought some Bioderma (see post here), I am using that in place of Clarins one-step cleanser and Garnier cleansing milk. But this is what I used before and is easier to get hold of. What are your skincare favorites? Have you tried any of these? PS: can you spot me in a rather fabulous selfie on my friend, Alix's blog?